It’s the most wonderful time of the year! — for most people, at least. I, for one, am not a huge fan of the Christmas season — the songs, the gifts, the cold, the people, the laughter — none of it! But what I do love is decorating, and Christmas is the perfect excuse for me to get crafty and turn the house upside down. I’ll be sharing with you one of my favorite and easiest DIY Christmas decorations that I learned from a fellow blogger: A waterless snow globe! See, I might hate the snow and cold outside, but I have to admit that it’s beautiful! So with these orbs, I can have that magical experience from the comfort of my warm, cozy home. onate to your jar (whether it be a mason jar, baby food jar, etc.). Grab your hot glue gun and glue the trees into the lid. 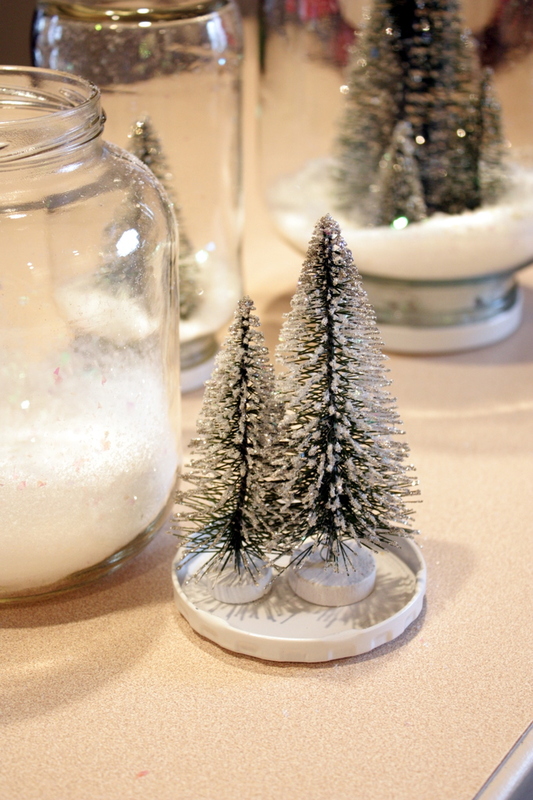 Then pour snowflakes into the jar and screw on the lid. Now flip it over and enjoy your precious waterless snowglobe. .S. I’ve also done this with small toys instead of trees (cars, Polly Pocket dolls, chickens, etc.). Get creative and build your own story in a jar, then place it on a windowsill or table to enjoy!